Ukraine's Air Assault Forces will receive new types of weapons as soon as possible, Ukrainian President Petro Poroshenko has said. "The pace of retooling on new types of weapons does not fully meet our needs. I want to assure you that the state will do everything to solve these problems as soon as possible," Poroshenko said during a meeting with the squad of the Armed Forces of Ukraine after completion of exercises in the Zhytomyr region on Wednesday. According to him, short meetings have already been held with representatives of the Ministry of Defense and the leadership of the General Staff. "Tasks have been set to make relevant proposals, relevant instructions will be given to the Ukrainian government, and appeals to parliament," the president said, adding, "I declare the following: the Ukrainian army will always have the full support of the commander-in-chief." 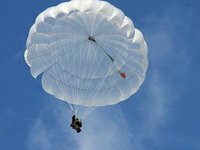 Poroshenko said in 2019 Ukraine's Air Assault Forces would receive both domestic and foreign equipment. "Next year, work will be continued on staffing the units of the airborne assault troops with armored personnel carriers ... and the best models of foreign, cargo and special vehicles, Svityaz command and staff vehicles, anti-tank missile systems ... including the Javelin," Poroshenko said, adding that 40 Hummer and ambulances have already been received from foreign partners.